Ha-Chi Yu is the director and founder of LaLaLå! Jivamukti Yoga Los Angeles. She recently built and opened the first Jivamukti Yoga School on the west coast in a beautifully transformed space in the Arts District of DTLA. Ha-Chi was born and raised on the Lower East Side of NYC, growing up in the same time and place as Jivamukti itself. She was a principal dancer with Feld Ballet/Ballet Tech for over 20 years during which time she also performed with numerous dance companies and productions on and off-Broadway. 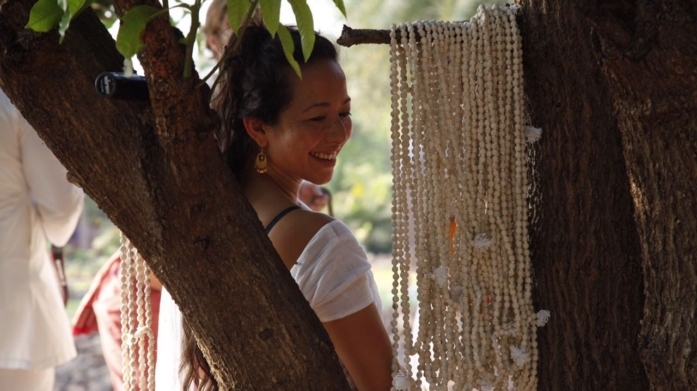 Ha-Chi is an Advanced Certified Jivamukti Yoga teacher, founder of Prana Productions LLC, and has served as producer, faculty, mentor and Program Director for Jivamukti Yoga® Teacher Training programs internationally. She has studied with esteemed teachers within various schools including: Sivananda, Iyengar, Ashtanga, and Tripsichore. Ha-Chi is also a certified teacher in Gyrotonic ™ and Pilates. Her background as a dancer and teacher has taken her around the world where she has taught master classes at colleges and universities; international festivals, trainings and workshops; and performed on many of the world’s finest stages with some of the greatest performing artists of our time. Ha-Chi is honored and humbled by the blessings and support of the global satsang – by their love she built the first Jivamukti Yoga School in California, and she dedicates her efforts with eternal gratitude to Sharon and David, Jules and all the jivanmuktahs around the world. Whenever she can, she travels globally as a teacher and student of yoga…while dancing with the whirling dervishes whenever they cross her path. Through intelligence, strength and fluidity Ha-Chi’s classes focus on the practices of yoga as a tool for integration of ancient teachings applied into our modern day life- with relevance, joy and reverence.